Spooling is a form of multi-programming that copies data between different devices. These are also used for communicating between a devices computer application and the device itself. Spooling has programs that give the work to a peripheral to then proceed to other instructions. A program called ‘the spooler’ keeps a list of jobs for the peripheral and sends the data at its own rate. There are also slow input peripherals which can maintain a list of jobs waiting for data and starting each job when the relevant input is available. The ‘spool’ is essentially a list of jobs in a storage area that can drive devices at maximum speed without much impact on other processing tasks. Printer Spooling While everyone isn’t familiar with what spooling is when it comes to computing, most everyone is aware of the print queue that comes up when printing several documents. When you select the print button on the computer, it then sends the signal to the printer and the data is then transmitted, this tells the printer what to print. This process needs to be regulated for it to function correctly though. The spooling sends the data at the speed of the computer, then the data is printed onto the paper at the speed of the computer. While this is happening, multiple processes can spool without waiting, and can be free to perform other tasks. This is done while the printer is operated by the spooler process. A good example for this is if a company had four hundred payroll checks to print out, their computer would process the information within seconds. The payroll program would put everything in order and would be ready to print once the user inputs all the necessary information. However, printing the checks could take a long time to print. If there were no spooling while this process was happening, the user wouldn’t be able to process any other computations until all the checks were printed and the CPU gets the signal that signifies the end of that job. If you use an office printer, you know that there are several people who use the same printer, and they too use spooling in a different way to make sure that the jobs that are sent to the printer are organized. The program the device uses will apply these spooling techniques to put all the jobs in a queue and can do several other things like notifying the user that their print job has successfully ended, selecting size and appropriate paper for a document, or even distribute jobs among other printers if need be. Other applications Spooling is also used in punched card readers and magnetic tape drives. 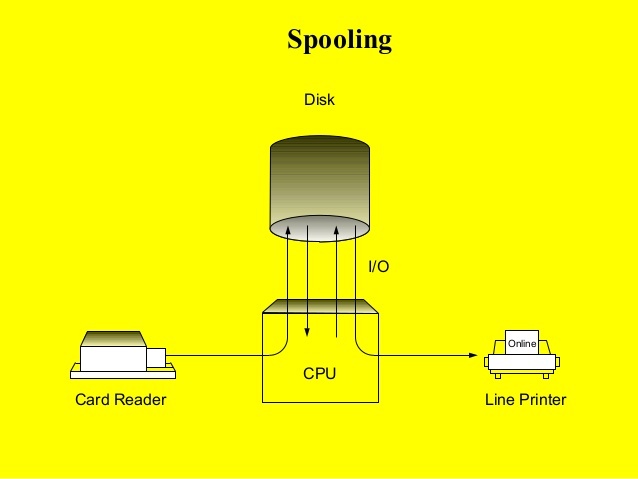 Spooling is used by a batch processing system to have a queue of tasks that are ready to be executed. They will then start as soon as the system can process them. DriverAssist can scan and review your computer for drivers that will keep your devices running smoothly.